Apparel Made in Canada! 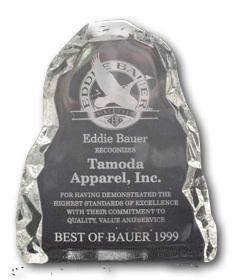 | Tamoda Apparel, inc.
Tamoda Apparel, Inc. is Vancouver B.C. Canada’s leading manufacturer and designer of all apparel and outerwear products. Our location in Vancouver Canada ensures our customers the highest standards in quality and workmanship at a competitive price. base is selected. We are also the official training ground for Eddie Bauer , The Hong Kong and Shanghai Bank, and various apparel design and manufacturing schools in the Vancouver area. Please contact us toll-free at (888)250-5694 for a complete list of customers and references.